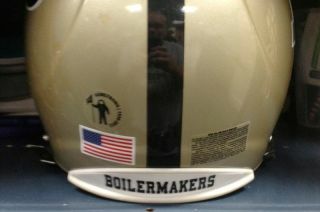 Snapshot of Purdue University Boilermakers' football helmet with decal paying tribute to the late astronaut Neil Armstrong. When the Purdue Boilermakers take to the field Saturday (Sept. 8) at Notre Dame, the West Lafayette, Ind., college football team will be sporting a new tribute to one of their school's most famous alumni: Neil Armstrong. The team's helmets will be decorated with a decal showing the astronaut and inscribed with the years that he lived. A 1955 Purdue graduate and the first man to walk on the moon, Armstrong died on Aug. 25 at age 82. He will be mourned during a public memorial service on Sept. 13 to be held at National Cathedral in Washington, D.C., before being buried at sea by the U.S. Navy. "Neil Armstrong is likely the most famous and inspirational alumnus Purdue has ever had, and has been an integral part of campus life from his arrival as a young student in the '50s to today," said Tim Sands, the university's acting president, in an Aug. 25 statement. "He was a humble and private person, but always willing to talk to students. He was passionate about encouraging young men and women to pursue careers in science and engineering." In 2007, Purdue named its new engineering research and education building after the first moonwalker. An 8-foot tall (2.4-meter) sculpture of the astronaut as a student sits outside the Neil Armstrong Hall of Engineering. A year later, Armstrong donated his personal papers to the Purdue's library archives. After his death, the Boilermakers head coach Danny Hope shared Armstrong's exploits with the team, which inspired 5th-year wide receiver Tommie Thomas to request that the Boilermakers find a way to honor the astronaut. In response, Purdue came up with a sticker to add to Thomas' and his fellow football players' uniforms. Starting with this weekend's game, and remaining for the rest of the season, the Boilermakers will have the sticker placed above the American flag on the back of their helmets. The black and white decal shows a spacesuited astronaut in silhouette holding a Purdue flag. The text on the sticker reads, "Armstrong / 1930-2012." The design of a sticker being added to Purdue University football players' helmets in honor of astronaut Neil Armstrong, who died on Aug. 25. Purdue held its own memorial service on Aug. 27 outside the engineering hall. Students and others placed candles, flags and flowers at the base of the Armstrong statue. More than 20 Purdue University alumni went on to become astronauts, including the last person to leave footprints on the moon, Eugene Cernan.